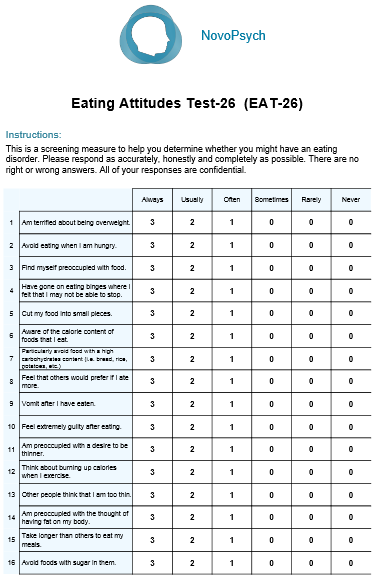 Higher scores indicating greater risk of an eating disorder and total scores 20 or above are considered to be in the clinical range. 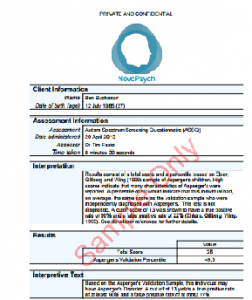 In addition to the raw scores the results are presented as a percentiles based on a healthy female sample (n = 140) and a sample of anorexia nervosa patients (n = 160: Garner et al., 1982). A percentile of about 50 is typical in comparison to the anorexia nervosa group for someone suffering from an eating disorder. The four behavioural questions (questions 27, 28, 29, 30 and 31) are not included in the calculation of the above scores, but are major risk factors important to the health of people with an eating disorder.